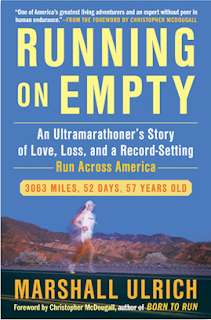 I know not everybody is driven by or even interested in running anything further than 26.2 miles, but that doesn't preclude them from getting any benefit or inspiration from Marshall Ulrich and his book Running on Empty which goes on sale today. Running on Empty is An Ultramarathoner's Story of Love, Loss, and a Record-Setting Run Across America and shares all the behind the scenes information on what he had to go through to complete the 3,063 miles in just 52 days. The book is an easy read with a relaxed style and in many ways I find it reads similar to a very long blog. You feel like you really get to know Marshall as you read it and you become part of his journey. At any age it would be a challenge to run across America, but at age 57 Marshall had more to deal with than if he was much younger, not to say there is a prime age to be an Ultramarathoner. As you can imagine you cannot run across America without coming away with many stories. Stories of meeting people along the way, almost getting hit, injuries of different degrees, and funny stories I will have to keep secret till you read it for yourself. The book wraps up with the training schedule he used to prepare for high daily mileage that would be required if he was going to cross in the time it would take to set the record. 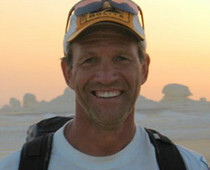 This training schedule was created for him by fellow Ultramarathoner, Ray Zahab. Before I go on I want to tell you about the 52.5 hour promotion that is going on right now as a way to help make your purchase of the book even sweeter. From now until 12:30 PM EST on April 16th anybody that buys at least one copy gets additional bonus items. You can find more information at the 52.5 hour promotion site. Don't forget to watch this short video about the book and read through this excerpt before finding at the end how you can win your own copy of Running on Empty. Some people find my feet fascinating because I have no toenails. Magazine and newspaper folk have interviewed me about them and photographed my toes, which friends have described as little bald-headed men, or ten nursing piglets. Why, reporters always ask, would a man go so far as to have his toenails surgically removed? What kind of person alters his anatomy for sport? Look, the toenails are the least of it. The kind of sacrifices you make when you’re running hundreds of miles are considerably more profound than whether you’ll ever get a proper pedicure again. But I understand the freak-show quality of my feet. It’s like the Everest mountaineers’ blackened, frozen fingers that mesmerized me years ago: It symbolizes something, says something about a person’s commitment. What that something is—unlimited human potential and extraordinary daring, or something darker, like madness and obsession— seems a mystery. The real sacrifices? Family relationships often suffer in the ultrarunning community; clearly, mine are no exception. The time away from home, the solitariness, the stubborn self-reliance all take their toll. Mar- riages are ruined, children alienated. During the races themselves, people battle dehydration, salt loss, sleep deprivation, blisters that make the most hardened athletes buckle, trashed knees, pulled hamstrings, acute tendonitis, and more. In the face of all this pain, ultrarunners also tend to develop a morbid sense of humor. Dr. Ben Jones used to bring a coffin, fill it with ice, and submerge himself to cool off during the Badwater Ultramarathon. (Ben is a coroner, but still.) Actually, it’s rare for someone to die doing this sport, but it’s not at all rare to want to. Once, I asked a physician friend of mine, a cardiologist, if a person could run himself to death—I wanted to know how hard I could push myself. No, he told me. Your body is smarter than you are and will “put you down” first, meaning you’ll drop from dehydration, or pass out or something, before you can run yourself to death. Why do we go the distance? Is it a cult? An addiction? Some kind of penance? Do we have something to prove? What do we get out of it? The answers to these questions are nearly as individual as the runners themselves. Charlie Engle, for example, would say yes, it’s like an addiction— he traded cocaine and alcohol for competition. Ray Zahab would tell you that he started running for his health, dropped a pack-a-day smoking habit, and then got hooked by the personal discovery that comes from covering long distances in exotic lands, and finding opportunities to connect with and contribute to people from different cultures. As for me, sure, there’s an underlying compulsion: survivor’s guilt and a need to punish myself, to prove myself, to face down my own mortality, to defy death. But my running is also a reflection of my upbringing, a work ethic, a personal challenge. My love of history gets interwoven, too—the feats of other people in other times coupled with the alluring possibility that I might be able to go farther, faster, today. Reprinted from Running on Empty by Marshall Ulrich by arrangement with Avery, a member of Penguin Group (USA) Inc., Copyright © 2011 by Marshall Ulrich. In addition to my review copy I was provided with the opportunity to give away a copy to one of my readers. To win just leave a comment on why you are drawn to this book and why you would like to read it. Feel free to share it any way that you would like for an additional entry for each share. Entries will be taken until April 21st, and I will choose the winner in the days following. **Update 04/15 - I just purchased a copy of this book from Amazon for Victoria Isom, my 300th Like on the 26.2 Quest Facebook Fanpage, you should stop by and Like as there is always something more going on there! Book sounds awesome! I always love reading running books, fiction, nonfiction, sprinters, ultras, because it keeps me motivated and encourages me to keep pounding the pavement every day. I was not aware of the book before today. This has peaked my interest in reading his story. I was not aware of the book before today. This has certainly peaked my interest in reading to find out more of his story. It sounds like an awesome read and very inspiring! I love reading books on running its makes me want to run longer ,further and faster ! I ran my first ultra last Oct. and am very excited to run another. I would LOVE to read this book!!! Nice review - thanks for sharing! I just found out about this book and would love to read it! I admire ultra-runners and learn so much from them that it keeps me motivated as I train to run my first marathon in May. I love all books running-related! They have become my favorite kind of books to read and before I stared running myself, I would have NEVER picked up any kind of book dealing with any kind of sport. Thanks for the giveaway! Yep, you should have gone with the naked in the bathtub theme. Works everytime. No pain no gain! I hope this book will bring motivation and inspiration to me. Sounds like a great book. I have wanted to read this as soon as it came out but have not gotten around to getting it. I'd like to read it because it's about running but not JUST running. Thanks! I would love to run a ultramarathon in the fall and this would be a great inspiration! I love all books on running, I find they motivate me more to get out the door. This book definitely sounds interesting. This excerpt from Marshal Ulrich's book provides an amazing analogy of the Lenten season we are in. Christ's disciples and children alike, identified with the unassuming picture of a king coming into a city on the colt of a donkey. They cheered him like many cheered Marshal Ulrich as he relentlessly pushed on. Unfortunately, that same group became a howling mob that crucified Christ. But if I read correctly, He got up again, never to be defeated again! We may not be able to run across America, but we can address our own "Achilles Heel", and finish the race we, ourselves, are called to run. Book sounds fantastic. I love reading running books, they always inspire me to try things that I never thought I could do before. Running books are always on my list of MUST reads. This one I am really interested in as it may give me some insight into those friends that are huge ultra runners. Thanks so much for your review of Running on Empty. It's wonderful when people "get" that this is not just a running book, or a book just for runners. We appreciate you helping to spread the word. Thank you Heather for stopping by and your kind words!